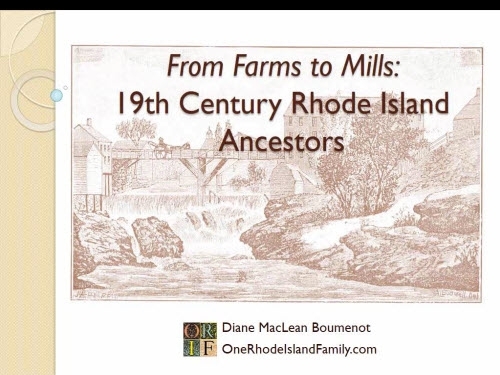 Since my post last year about research in early Rhode Island records “A Research List for 1650-1750 in Rhode Island”, I have had several questions sent to me about my 7th great grandmother Elizabeth Phillips and her possible father, Joseph Phillips of Providence. Another possibility for Elizabeth’s father is Joshua Phillips of Sutton, Mass. There are several other Phillips intermarried with the Ballous, so when I actually research this I may find the answer fairly easily. But for those in the Providence branch of the Phillips, there are serious questions. However, some disagree with Austin’s conclusion that Joseph belongs in this family. A correspondent mentioned to me that there were probate documents at the Providence City Hall that might provide some evidence one way or the other. Apparently, some of these descendants are involved in a Y-DNA project and they are getting some results that conflict with Austin’s list. 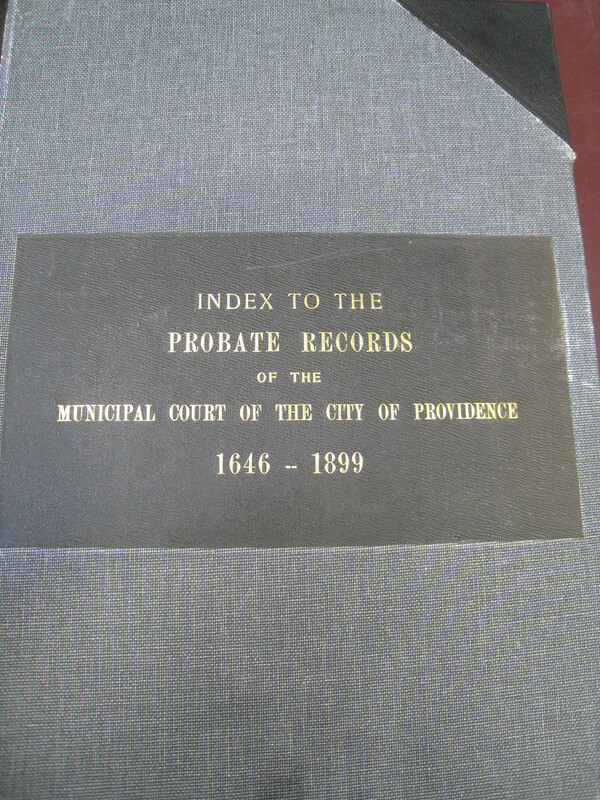 I had a chance to visit the Providence City Archives recently and I was able to photograph two early Phillips probate documents. I should stress that these were the only two early Phillips documents in the published index (pictured above) however I suspect there could be other records of deeds, wills, inventories, and administrations scattered elsewhere in Providence records. Or not. So, this is all I found today but there could be more out there. First of all let me say, being a bond, this was one of those documents that actually stays with the government (not a copy), and so what I saw at the Archives was the actual piece of paper signed (her mark) and sealed in 1719 by, Elizabeth (Malavery) Phillips, who could be my 8x great grandmother. It is the oldest document I’ve personally seen of that nature. Amazing. 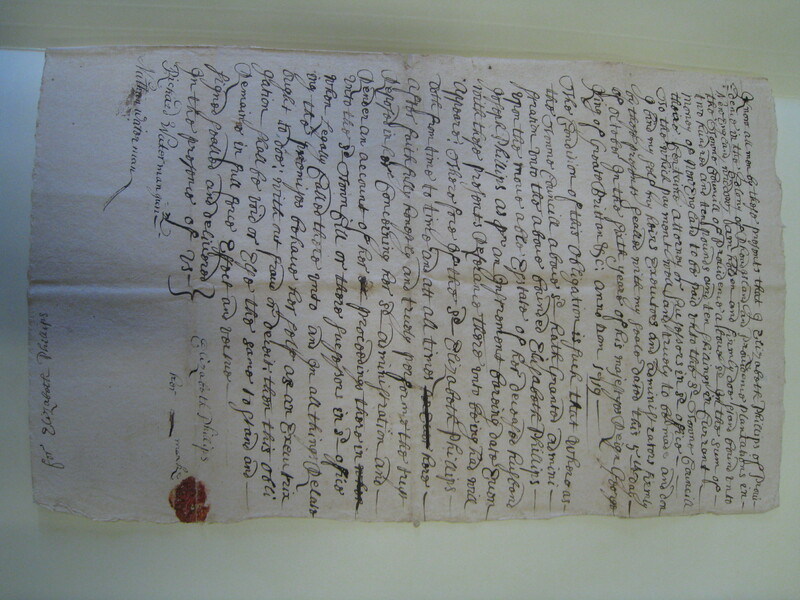 1719 Bond of Elizabeth Phillips. Clicking through will open it and allow you to enlarge. The condition of this obligation is such that whereas the Towne Councill above sd hath granted administration unto the above bounded Elizabeth Philips — upon the movable Estate of her deceased husband Joseph Phillips as pr an Instrument bareing date [Even?] 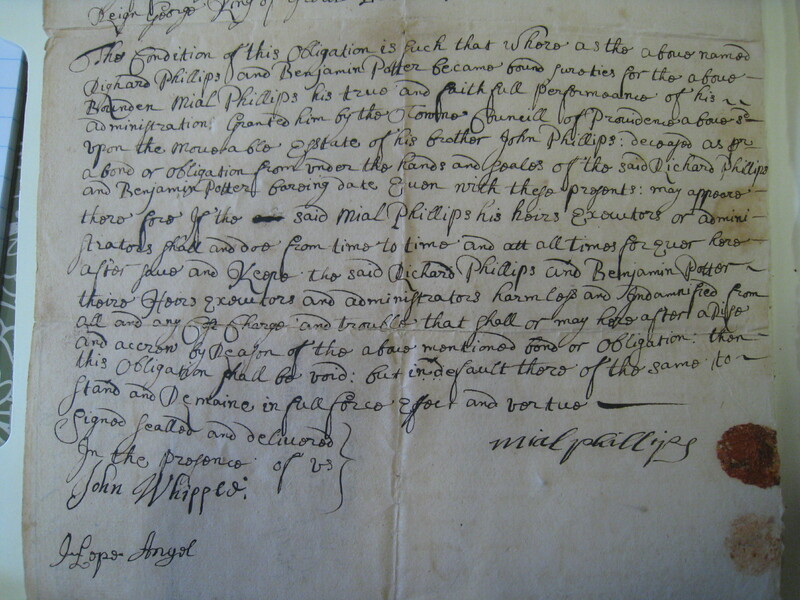 with those presents Referenced there unto being had will appear : therefore of the said Elizabeth Phillips – doth from time to time and at all times hereafter faithfully honestly and truly perform the trust reposed in her concerning her sd administration and Render an account of her proceedings there in unto the said town [Town Cill?] or their successors in sd office when legally called there unto and in all things relating the promises behave her self as an Executrix ought to doe : without fraud or deceit : then this obligation shall be void or Else the same to stand and remain in full force effect and virtue. Who were Richard Waterman Jun and Nathan Waterman? Were they just probate officers? she was granted administration “As pr an Instrument … ” – I wonder if I can find the will. If so, other relatives could be named there. Elizabeth was unable to write her name. Top of the first bond of Mial Phillips. Clicking through will open and allow you to enlarge. The condition of this obligation is such that where as the above named Richard Phillips and Benjamin Potter became bound sureties for the above Bounden Mial Phillips his true and faithful performeance of his administration Granted him by the Town Councill of Providence above sd upon the Moveable estate of his brother John Phillips : deceased as pr a bond or obligation from under the hands and seales of the said Richard Phillips and Benjamin Potter bareing date [Even?] with these presents : may appeare there fore if the said Mial Phillips his heirs Executors or administrators shall and doe from time to time and att all times forever here after [same?] and Keepe the said Richard Phillips and Benjamin Potter theire Heirs Executors and administrators harmless and indemnified from all and any Cost Charge and trouble that shall or may here after arise and accrow by Reason of the above mentioned bond or obligation : then this obligation shall be void : but in default there of the same to stand and Remain in full force effect and virtue. Clearly, Mial is meant to be the name Michael. I don’t think the document specifically calls Richard Phillips a brother to the other two, but it seems likely. 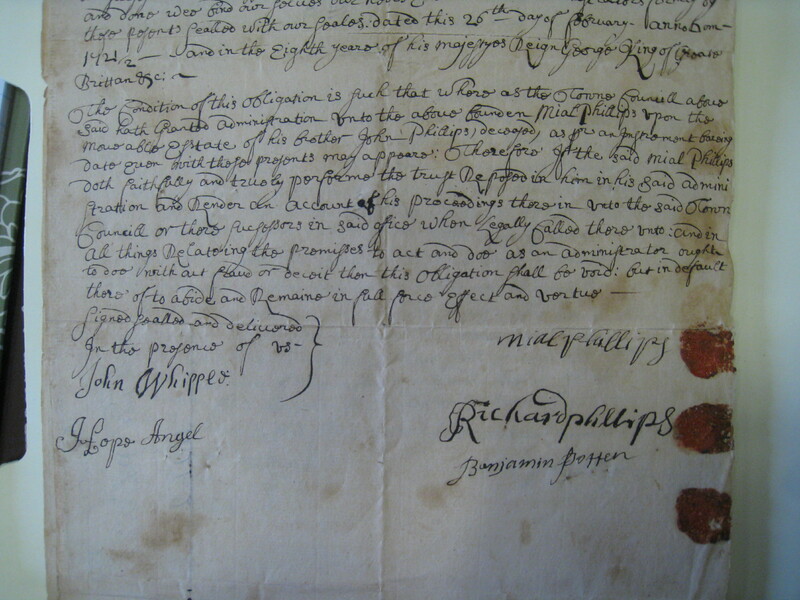 If, as indicated in the 1719 bond, Joseph Phillips is dead, he naturally wouldn’t be named in this 1721/2 document. I’m not sure much is proven here with regard to that. 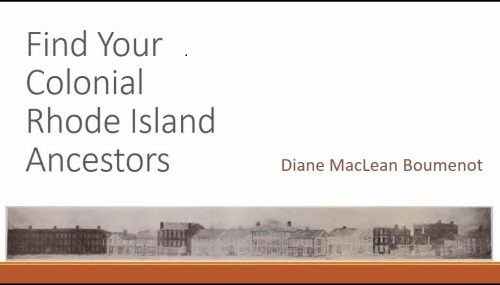 By mentioning a brother Michael, alive in 1721/2 (the FATHER Michael died in the 1680’s) this document either disagrees with Austin’s Genealogical Dictionary of Rhode Island or was signed by siblings from a succeeding generation. 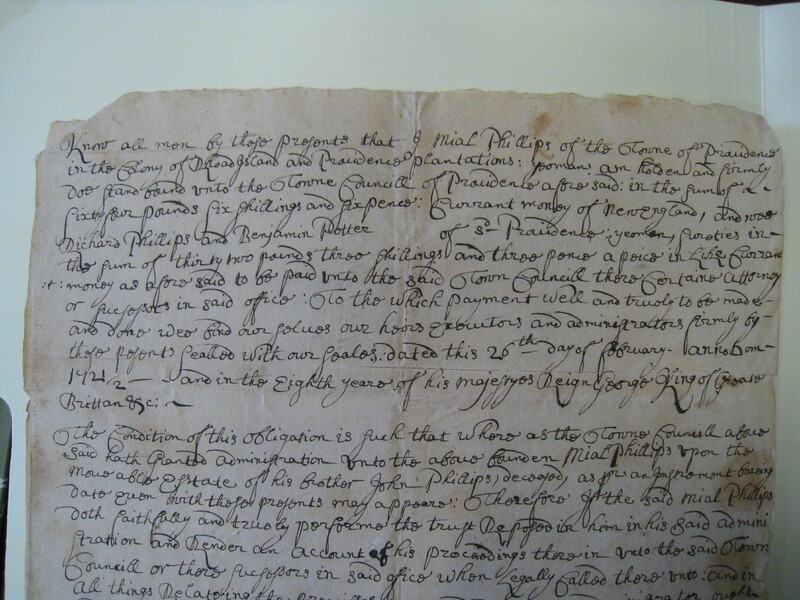 I have already left a few research notes in my post “A Research List for 1650-1750 in Rhode Island.” I would investigate all of Torrey’s references and any journal articles I could find, as well as a more thorough search of the Providence City Archives for further documents, like deeds or wills. There are Newport and North Kingstown connections for the Phillips, and those should be investigated. Of course, in my case I would start with the Joshua Phillips of Sutton idea, and pin down the other Phillips intermarriages with my branch of the Ballous. 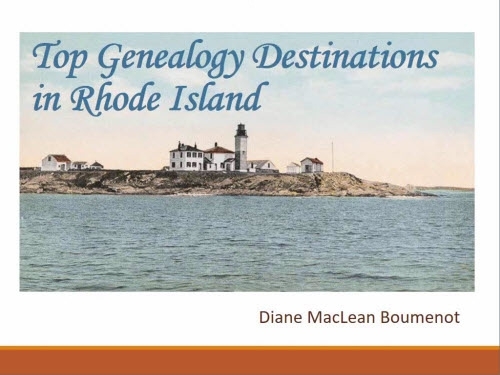 For an authoritative look at some of the early Phillips of Newport, see “A Family Discovered for William and Christiana (Barker) Phillips of Newport, Rhode Island” by Jane Fletcher Fiske, New England Historic and Genealogical Register, vol. 143, July, 1989, p. 221-233. Top of the second of the Mial Phillips bond documents. Clicking through will open and allow you to enlarge. The bottom of the second Mial Phillips bond.